A fine summery tale popped up in the pages of the Munster Express on August 21st, telling us that a family in the Grange area of the city of Waterford was being ‘haunted by a “nice” ghost’. The family has refrained from releasing their name or address, but we’re assured that the haunting has been going on for some 20 years. ME reporter Michelle Clancy was despatched to investigate, and ‘is convinced there is certainly some substance to the claims’. The ghost is apparently female, ‘a middle-aged woman who always wears her dark hair in a bun’, who seems to like watching the family from the stairs, as they go about their business (a good liminal vantage point – between floors). She has been found having conversations with the children of the house, and has driven the mother demented with classic poltergeist activity, most of it relatively friendly – tapping, cutlery being collected and the sound of a sewing machine and knitting. She claims that one night, however, she was thrown from a chair. . . they have concluded that the lady is a former resident, and resents another woman of the house. She’s still supposed to be still about, with a sighting as recent as a month ago. Whatever we’re to make of this, it doesn’t seem possible to pry further without attempting to compromise the privacy of the family. However, the article mentions some other well-known Waterford ghouls, such as the White Nun, ‘said to wander the road at the back of Presentation Convent at night’. The Banshee, another favourite, has been traditionally spotted sitting on various walls throughout the city, combing her long windswept hair, and driving the local canine population demented with her wailing. I’ve been unable to unearth any useful Waterford Banshee material in Patricia Lysaght’s *The Banshee – The Irish Supernatural Death Messenger* (O’Brien 1986, ISBN 0-86278-490-5), but will dig further. This Blatherskite however, was once a resident of Waterford, and had a tussle with something that at least purported to be the Banshee. It was in the early hours of a spring morning – very early in fact, the milkmen were out, and dawn was just breaking – and I was strolling home through The Glen and on to the top of Thomas St. I stopped in my tracks and felt the hair on the back of my neck stand on end, due to the unearthly screeching which emanated from somewhere in my immediate vicinity. I remember describing it later as sounding like ‘a dog doing an impression of a cockerel’. I didn’t feel particularly comfortable about what seemed to be so close to me, and resumed a walking pace downhill to the junction of Thomas St. and O’Connell St. Thomas St. has only one crossroads between The Glen and O’Connell St., and is lined with terraced houses and the odd business, all of which are facing directly on to the street, without car parks or gardens. The ‘noise’ followed me as I covered the last 50m to the archway of the a florist’s building, where I resided on the fourth floor. Once inside, I quickly climbed the stairs, to find my flatmate’s bedroom light on. It later turned out that he too had been woken by the sound. I rationalised later that it was a rather weird seagull, as I’d often heard and seen a nocturnal seagull with a strange wail wheeling around over nearby Broad St. late. How and ever, such rationalising didn’t go far towards dispelling the fright I got that morning. It was only several years later that I discovered that many other people have had similar experiences in Waterford city center while walking home at night…and now it would seem that the Bán Sidhge herself is being blamed. Or is just a laryngitic gull? In addendum to last week’s Norwegian lake monster ‘expedition’ diatribe. . .
which claim ‘*possible contacts*’. Simrad and Bennex, manufacturers of the team’s echo-sounders and side-sonars respectively, are to give an answer at the end of the week detailing their final findings of material submitted after the expedition (which, although slated to run from August 3rd-20th, mysteriously concluded on August 17th, according to the GUST website). According to Sundberg, Simrad say that there is room of ‘other interpretations’ other than fish, and Bennex have found readings which ‘can’t be easily explained’. I can hardly contain my enthusiasm. Sundberg tells us that Ulf Burman’s video, mentioned last week, ‘probably shows ducks’. I would tend to concur with this. 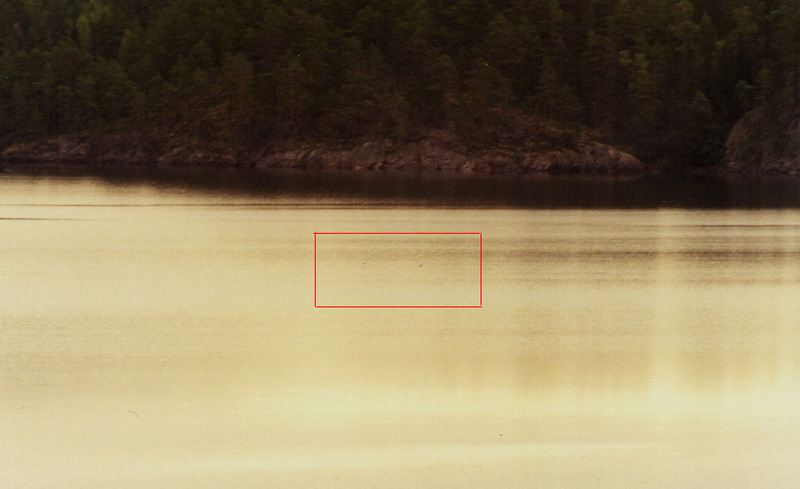 On the morning of August 8th, Magnus Backlund, Peter Lackbar and I watched two ‘V’ shapes moving in the water of the lake, from a rock some 10m above the water surface. The movement was about 200m away, and small dark objects were silhouetted above the water at the apex of the Vs. I squeezed off a couple of photos on a 300m lens and 400ASA Fuji, but after spending *some time* watching the objects, they too turned out to be ducks. Interestingly, I don’t think I’ve ever spent time on any body of water with such a dearth of any kind of fowl as Lake Seljordsvatnet. I couldn’t find anyone who could explain this phenomenon, either. 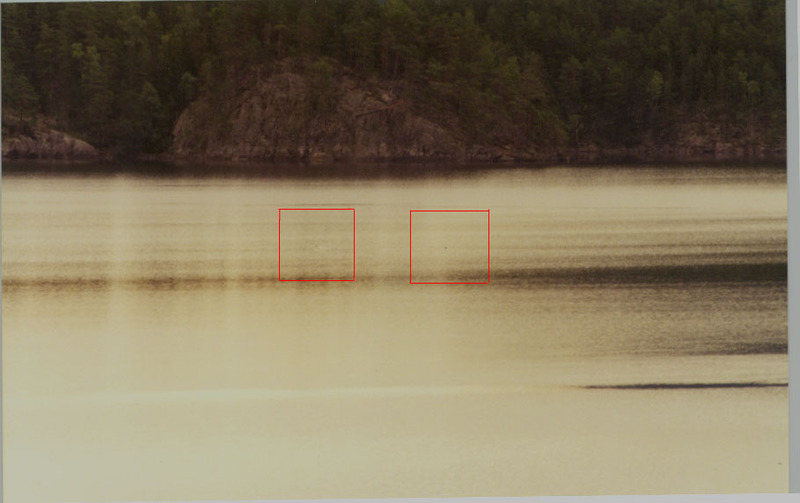 To get back to the latest GUST news, Sundberg has conceded that his ‘stills are probably impossible to analyze, as careful studies in the computor (sic), from a CD-Rom made by Kodak in Oslo, reveals that nothing is seen above the surface of the lake’. Well, bowl me over with a tentacle. This is considerably different to the tale we endured on Sundberg’s return from Kodak on August 13th. More news next week, perhaps. Last week, I mentioned some of Michel Meurger’s findings on recurring motifs in lake monster lore. One of the typical attributes to such lakes are that the lake *does not give up its dead*. I’m currently getting snippets of H.J. Sansdalen’s *Seljords Ormen* (Seljord Kommune ISBN 82-992140-0-9) translated from Norwegian to English, as Meurger mentions that this motif has been attributed to Lake Seljordsvatnet, as found on pages 14-15 of Sansdalen’s book. Some of the biologists from BÃ¸ University (close to Seljord) reason that the due to the chemical nature of the water, Lake Seljordsvatnet would tend to return its dead to the surface. This is due to high oxygen levels which *suggests* that dead matter would rapidly decompose without allowing for gas from the putrefying bacteria to have time to collect and make the carcass buoyant (thanks to the Dr. Jason Gibb for this information). While much apprehension has been aired regarding the apparently forthcoming Mothman Prophecies movie, news has reached the Blather entertainment desk that the one and only Jon Downes of the Centre for Fortean Zoology has made a film of his book, *The Owlman and Others*, the story of the birdlike humanoid said to haunt the grounds of Mawnan Church in Cornwall. Miraculously managing to avoid basing the movie on the original story, it does, however take place in Cornwall, and features a ‘camp cowboy journalist’, a ‘pre-op transexual Nazi sidekick’, a wizard, a ‘feathered bird-entity’, a naked witch, ‘Morgawr the Cornish Sea Dragon (played rather convincingly by ‘Cuddles’ – the Two Toed Amphiuma who resides in a tank on the landing of Jon’s house in Exeter)’, the ghost of Max Ernst, lavatory-haunting MIBs, a paranoid zookeeper with a mutilated wallaby, the lemonade man of Ponsanooth and a kick-boxing vicar. Alleged to be ready for viewing by the 1999 Fortean Times UnConvention. The number of Irish ufological (logical?) groups seem to be rapidly multiplying. I don’t tend to judge books by their cover, but *Golden UFO Investigations* in Carrick-on-Shannon sounds decidedly dodgy. *UFO Research of Ireland* in Clontarf, Dublin, comes across as rather more sober, but long-time readers of Blather may share my lack confidence in this respect. “The sound of a dog immitating a cockerel” or a “laryngitic seagull” is exactely how I would describe the “bark” of a FOX!!! I was surprised to hear that horrible strange sound one night in Dublin, in a green area, and there it came out of a bush, a beautiful fox, and I still found it hard to believe that this small fox could make that kind of sound!